CARRAMAR has been nominated by FOCUS (Friends Of the City of Unley Society) to be listed as heritage at risk by the National Trust. This lovely old building is one of a few remaining heritage buildings on Greenhill Rd. 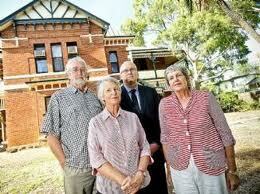 Unfortunately, even though it is on the State Heritage Register, it has been listed for sale as a development site. In theory any development should take into account the listing of the house and development should be sensitive to the preservation and restoration of the house. Currently it is at risk as the Land Management Corporation (now part of the Urban Renewal Authority) has advertised it for sale as a development site. Carramar is historically important for several reasons. The land was originally taken up by the South Australian Company. In 1886 a ten roomed house was built for Robert Gardiner. In 1909 James and Johanna Gosse (nee Barr Smith) were the owners, Gosse was a prominent solicitor and business man in Adelaide. Lady Downer is a daughter of James and Johanna and was born and grew up there. The house was recognised as a fine example of uncommon Federation/Queen Anne domestic architecture style, use of materials and a high level of building craftsmanship. As this area is set to be rezoned to allow for more intense development (7-10 levels), at state government insistence, the outcome may not be one that envisages the house as part of the development. Thanks to Unley Museum and National Trust SA for information.